At least this years favourite is this recipe which turns everything upside down: Rhubarb stalks sink into hot caramel and are covered by an almond flavoured batter. In a miraculous way baking in the oven turns this into a moist and tender but as well textured cake (thanks to whole grain flour and grounded almonds). Sweet jammy rhubarb that hasn’t lost all of its tartness has deeply sunk into this bed of cake, same as the caramel flavour. This great combination of flavours and textures is topped and completed by a dab of half sweet, half tart and a little grainy ricotta mixed with elderflower blossoms that bring their distinctive floral honey-like scent with them. – A perfect cake for your summer sunday afternoon (or every other time of the week and day), our Sonntagssüß (sweet sunday), although it was already last weeks sunday cake! 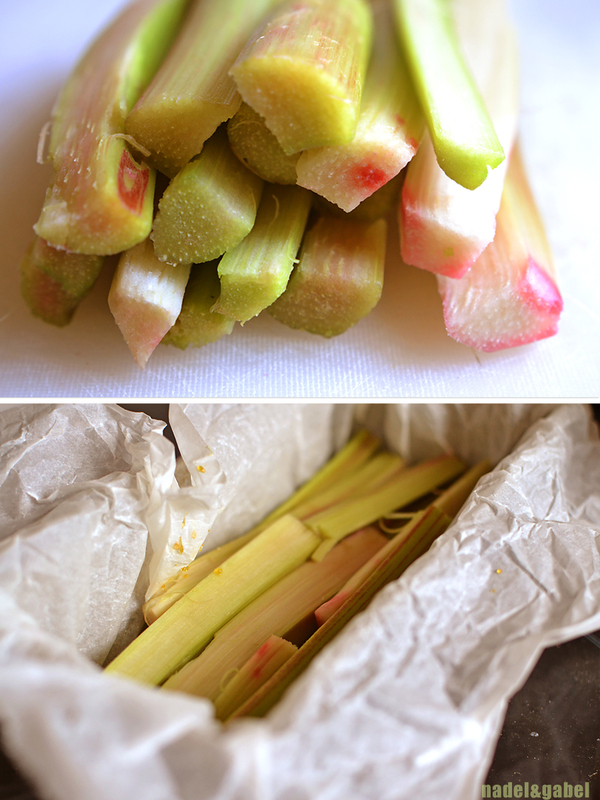 Wash and peel rhubarb. Cut each stalk in half and halfen lengthwise as well. 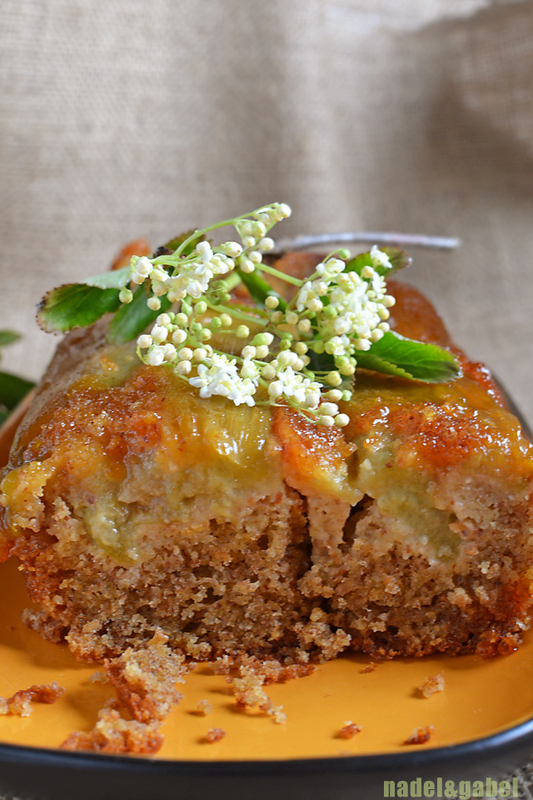 Caramelize 100 g of sugar in a pot and pour hot caramel into a loaf baking pan layed out with baking paper. (Alternatively you can use a round baking pan and reduce baking time a bit.) Lay out rhubarb pieces on top. Be careful at all points when you’re working with hot caramel! Preheat oven at 180° C. For the batter whisk butter, remaining sugar, vanilla and salt until light. Add eggs, one after another. Mix flour, almonds and baking powder in a separate bowl and add as well. Spread batter over rhubarb. Bake for about 50 minutes. Cool cake in the pan for about 30 min. until it is still warm, but not hot anymore. 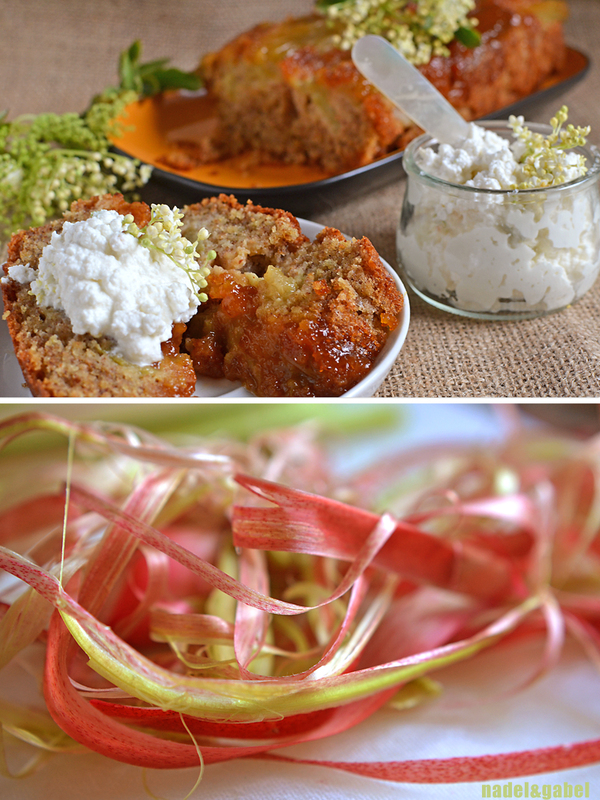 Then carefully turn out cake on a plate with rhubarb on top. Watch your hands: not all of the still warm caramel will have fully soaked into the rhubarb and batter. Let cake fully cool down. For the topping wash elderflowers and remove stems. 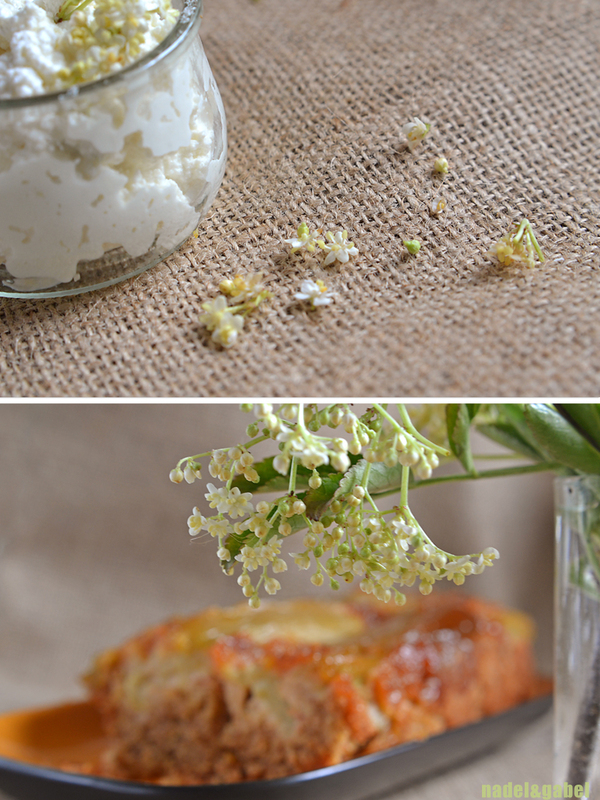 Mix blossoms with ricotta. As ricotta and elderflowers are already a bit sweet I didn’t add anymore honey or sugar. Feel free if you like to. Cut cake into thick slices and enjoy with a dab of ricotta. Beautiful photos and everything looks delicious. Love the fonts and design you did in the first photo. Thank you, Tori! The fonts you liked so much are karabinE, Honey Script and Bergamot Ornaments. i love upside-down cakes. and i love rhubarb. 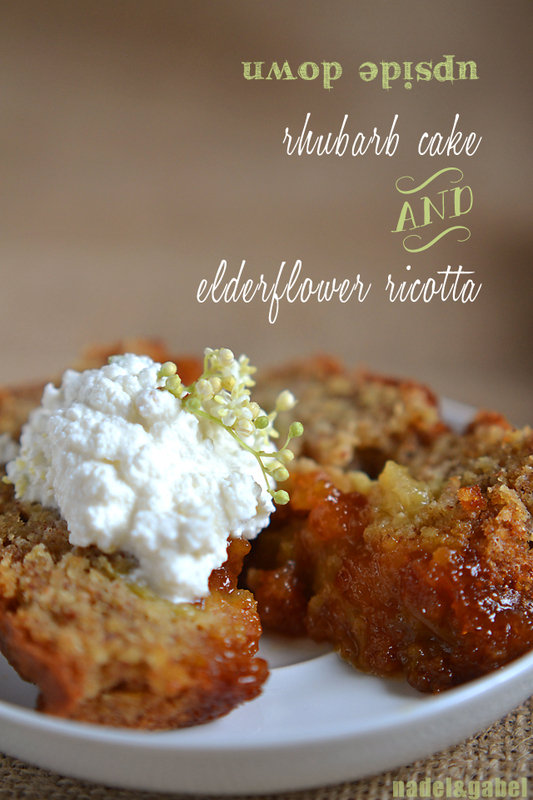 AND i bet elderflower is a great combination in this cake! looks lovely! !